For a variety of reasons, Canada remains a top choice for many United States companies or brands looking to expand outside their home market. Some reasons for this are geographic proximity, a common language and a similar legal system, as well as similar consumer income and spending habits. But there is also the advantage of developing into a market where there is a much greater chance of the market having awareness of the company or its brand. This is mainly due to American media that Canadians are exposed to. U.S. franchises (many in the restaurant industry) often look to Canada as the first place to expand internationally. In fact, in recent years U.S. retailers and non-retailers have started to expand here. Not just the large ‘big box’ store retailers, but also smaller novelty retailers and brands. When smaller companies try to make inroads here in Canada, they often think doing business will be the same as in the United States. The best thing they can do if they want to assure their success is to do their homework. U.S. companies that expand to Canada without carrying out the necessary preparations are often hampered by a lack of understanding of the complexity and diversity of some Canadian markets. They may encounter problems clearly differentiating their product or service to similar competing Canadian products or services. Researching the similar products or services that are currently offered can save a company a great deal of headaches when they enter the Canadian marketplace. 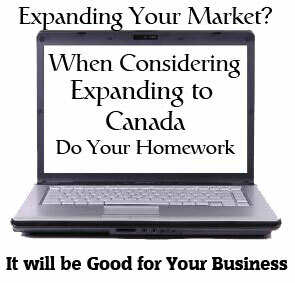 Choosing the right market can also be key to your Canadian expansion plans. Canada is far from a fairly homogeneous U.S. market. Remember, Canada is a very multicultural country with a population that hails from various religions, areas of the world and cultural backgrounds. Sometimes it may appear that certain ethnic groups make up a specific geographical area, but that is not always true. So what is the best strategy? Establish a test run for your product or service in Canada, while minimizing your commitment and risk. Hire a local professional who has experience in your industry. This avoids having to go through the process of acquiring work visas and other necessary paperwork until you know you can make a go of your Canadian expansion. To avoid having to hire local administrative staff, set up a local virtual office in an office business centre and have administrative calls routed to your U.S. headquarters. The other reason for this is, when you decide to open a physical office in Canada, you can rent an office at the very same business centre without having to change your business address.